It was early 1996. When the 166 Academy Awards nominations were announced, only one of them was for a black person. African Americans called for a boycott of the ceremony. They asked the black host (Whoopi Goldberg) and black producer (Quincy Jones) to step down in a show of solidarity. Both refused. Sound familiar? Last month, when the list came out, none of the 20 up for best actor or actress in lead or supporting roles were people of color. African Americans once again called for a boycott and for the black host (Chris Rock) and black producer (Reginald Hudlin) to abandon the telecast and support the cause. They too refused. Let’s see what happened between those 20 years and why now, we may finally have a solution for the motion picture industry’s lack of diversity. After Rev. Jesse Jackson called for a boycott of the 1996 ceremonies, going as far as asking any and all black talent to not attend the event, I was included in a conference call with him and black leaders. I carefully told Jackson something he didn’t want to hear: He shouldn’t call for a boycott because none of us knew Nielsen family members whose viewing habits were included in the television ratings. If Jackson called for a boycott and the ratings went up, the headline the next day would be: “Jackson’s Boycott Fails.” The important issue of inclusion and diversity would be lost as the media played the two sides like a football game. Have the protest, talk about the same concerns, but don’t call for a boycott. John Mack of the L.A. Urban League was first to respond, “Uh, he’s right, Jesse.” The others mumbled in agreement. It took half an hour until Jackson agreed to go along. I wasn’t able to join the March 24 protest around KABC-TV, but MANAA board members Ben Bulatao, Rita Hollingsworth, Tom Eng, and Cheryl Villareal marched in support, the first two right beside Jackson. The ruckus led CBS President Les Moonves to agree to meet with 18 of us, which included Jackson, myself, and Sumi Haru. I praised Moonves for casting Cary-Hiroyuki Tagawa (who’d previously played villains) as a captain of the police force on the San Francisco-based show “Nash Bridges” and challenged him to reflect reality in all of his series. Moonves smiled, saying he accepted my challenge. When Tagawa had a falling out with star Don Johnson and left the show, I wrote three letters to the head of current programs pushing for CBS to add another Asian American to the cast. They eventually found Kelly Hu. And when executive producer Carlton Cuse created “Martial Law” starring Sammo Hung (the fat Chinese guy who nevertheless had great fighting moves), she was brought over as a regular there too. At the next Oscars telecast in 1997, Cuba Gooding. Jr. won for best supporting actor in “Jerry Maguire.” As he ran out of his allotted time and the orchestra tried to play him off stage, he wouldn’t leave, instead accelerating a list of people he wanted to thank, adding, “I love you!” I laughed with tears in my eyes. One of “us” had made it, had helped turn the tide around. 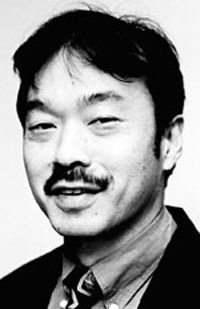 The following year, Chris Tashima won the Oscar for best short film for “Visas and Virtue” and gave a speech advocating more diversity in films. I was so proud. But the movement to change the motion picture industry and the academy died out. Contrast that with the summer of 1999 when The L.A. Times reported that of the 26 new shows debuting that fall on the top four networks, none starred people of color. 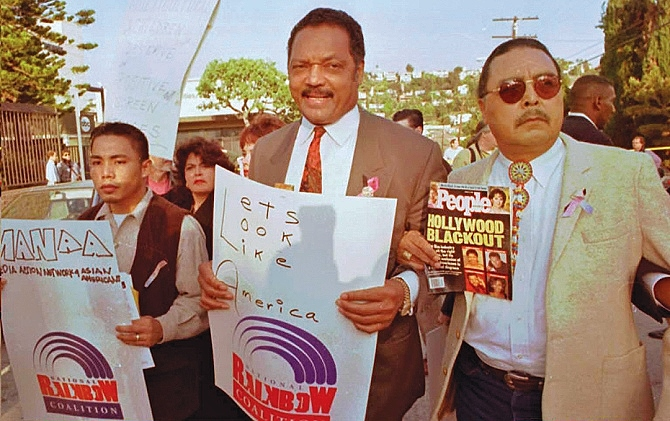 That prompted the formation of the Multi-Ethnic Media Coalition, made up of the NAACP, National Latino Media Council, Asian Pacific American Media Coalition (of which I’m a part) and American Indians in Television and Film. And in late 1999/early 2000, we began holding annual meetings with CBS, NBC, ABC and Fox. The increased diversity you’ve seen on television since then has been in large part due to our efforts, getting in there pushing, arguing, challenging, and congratulating the executives wherever appropriate. Most of those who cried foul when this year’s Academy Award nominations were mentioned were 1. Black. 2. Only complaining about the lack of black nominees. It was as if they couldn’t care less about Latinos, Asians, and Native Americans. It’s also why there hasn’t been any real change in the movie business since then: They complain yet lack the dedication to actually have a plan and follow through with it. Because films take a longer time to develop than television shows, it’ll be a while before changes show up on the big screen. But it took the #OscarsSoWhite controversy to light a fire under us to add the movie studios to our list of entities to engage (last year, we also met with five talent agencies pushing for more minority agents and clients). So maybe now, 20 years later, we’ve finally come up with a long-term solution. Front, from left: Ben Bulatao, Rita Hollingsworth (obscured), Jesse Jackson, Sonny Skyhawk. If you’re interested in seeing the press conference, check out these links. Thanks to MANAA Vice President Miriam Nakamura-Quan for capturing it on her iPhone. Turning the Tables Department: Last year, I was encouraged by the news that the new Muppets series was going to start off Tuesday nights at 8 p.m.; because the characters had so much built-in goodwill dating back to the ’70s, the show would probably do well, more viewers might stay tuned for “Fresh Off the Boat” at 8:30 and its ratings would improve. But quickly, people realized “The Muppets” wasn’t that funny, the ratings plummeted, and “FOTB” didn’t follow it down the drain. So ABC switched timeslots, moving “FOTB” back to 8 p.m., hoping it would help “The Muppets.” Well, that didn’t work. Last week, they fell 25% from their last airing down to a weak .8 rating amongst 18-49 years olds while “FOTB” boasted a 1.4. Turning the Tables II Department: The CW probably put its comedy/musical “Crazy Ex-Girlfriend” on Mondays at 8 p.m. assuming their only new fall show would be a ratings hit, which would help “Jane the Virgin” at 9 p.m. But CEGF usually only managed to get an anemic .3 18-49 rating, and “Jane” did better. But lately, CEGF’s improved to a .4 and this week, it beat “Jane” for the first time. The critically acclaimed show starring Rachel Bloom continues to amaze me in how daringly close it gets Rebecca Bunch (Bloom) to having to admit to Josh Chan (Vincent Rodriguez III) that she left New York to stalk him in West Covina, just as he’s slowly gotten closer and closer to her (and therefore, to her dream of winning him back). Two weeks ago, in front of her friends — including Josh — her boss denied the story she’d long told them, that she moved to the city simply because was offered a high-paying job at a law firm there. He revealed that Bunch called him willing to work for cheap. Somehow, Rebecca talked her way out of it and made Josh appreciate her even more. This week, she mistakenly sent him a text admitting why she moved to West Covina, and broke into his home to erase the message before he saw it. Then Josh caught her as she was trying to leave. Incredibly, Rebecca made up a story that made him feel sorry for her. But in the end, he caught her in a lie, so now, he may’ve realized there’s something wrong with her. The next episode airs Feb. 22. By the way, if you want to win swag from the show — a cap, T-shirt, and bag — follow MANAA on twitter @manaala as we’re giving away sets. “Hapa Is the Word!” Department: I was surprised how much I enjoyed “Grease Live!” on Fox, where they pretty much re-created every scene of the beloved 1978 movie but with the added challenge of doing it live on so many different sets at Warner Brothers. Whereas that film, which starred John Travolta and Olivia Newton-John, pretty much featured an all-white cast, in this production, one of the four Pink Ladies was black and two were hapa: Vanessa Hudgens (part Filipino) as Rizzo and Carly Rae Jepsen (1/2 Korean) as Frenchy. Even Elle McLemore, who played the nerdy Patty Simcox, is 1/4 Japanese. Although Hudgens looks racially ambiguous, the other two look as white as can be. So on paper, they included three Asian Americans, but it didn’t really impact the viewing audience who didn’t know the difference (it did prove what I’ve always felt, that Jepsen looks horrible in her usual bangs; she looked a lot better here with a different hairstyle).